Do you have a friend or family member who lost their baby or babies? Do you struggle to know what to say and how to act around them? Many families go through this loss, and we asked them to share what they wish their family and friends knew. 2 – Put these parents, and their needs, first. Everyone has different needs. Find out what they are, and be there. Opinions and advice probably will not be well received during a singular grieving process. It’s about them, and only them. 3 – Everyone heals differently and on a different timeline. Allow them to grieve and take steps when they are ready. The healing never ends, and there is no time when it is appropriate to expect that “they should be over it by now.” They work hard to get up every morning and make it through the day. Support them during the long process. 5 – Help them remember. It may be difficult for a parent to manage the loss, but she or he will one day want to remember. Take pictures, capture moments, and hold on to precious remembrances even if the parent isn’t ready to do so. In all likelihood, the day will come when they will appreciate the memories. One mom who experienced a loss 25 years ago tells us that her biggest wish today is some sort of remembrance. She didn’t capture photos or any items to remember her baby. 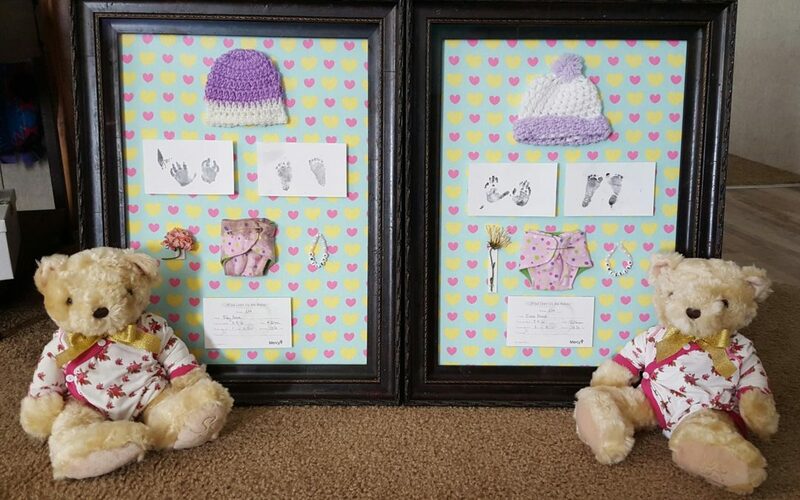 Another Mom who recently lost her precious babies shows, in the picture above, how her family remembers twins Riley and Rissie. 6 – Understand loss is an emotional roller coaster. One day a parent will be fine while the next finds her in tears. No matter how many years after a loss, there will always be triggers that are hard to anticipate. Support these parents through these emotional triggers, no matter how “trivial” they may seem. 8 – Name the beloved ones. Use the baby/ies’ names that are in the hearts of their parents. Read more stories submitted by Fetal Health Foundation readers. Is it time to share your story of loss or experience with a fetal syndrome? We find that reading stories of other a families is uniquely helpful to our readers who are often struggling with similar situations. Get started.